This story took place in the 3rd week of may and Beaujolais was quite damp and cold. We visited a couple of vineyards with Georges Descombes, and the vines looked indeed a bit late for this time of the year, and instead of a vivid green some leaves were bordering something more yellow than green, as if crying for more sun and light. Let's remember that Georges Descombes in his early years used to work for a bottling company in the region (his own father was also a vigneron), and of course, when you oversee a bottling machine, you taste the wine you're bottling, that an unwritten priviledge of the job, and when in 1982-1983 he tasted the wines of a then-unknown vigneron named Marcel Lapierre, he knew that these would be the wines he'd try to make later. Lapierre's wines which were titally uncorrected, unsulfited and unfiltered had a quality that stood largely above what he'd routinely taste in the vatrooms. Back to the weather in this spring of 2013 : Georges Descombes says (as of mid-may + when we visited the winery) that it was not very nice, lots of rain, quite late even if the season is only beginning and things can improve. They didn't have frost damage this time, contrary to last year. They has a bit of hailstorm on may 1st but the vineyard not having much foliage yet it was OK.
We stopped at a young Gamay vineyard planted in 2004. The vines are trained in goblet like usual, and low, near the ground level, but lightly above the height found in the old-time vineyards so that the plows can do their work without endangering the vines. If I'm right, this picture was shot on the Morgon area, on a terroir named Bois des Lys. Missing vines __not because of old age Georges Descombes vineyards are well taken care of, regular plowing, no chemical products apart from the organic-agriculture ones, and as a result a soil that looks alive and in harmony with the vines rooting through it. Here is a parcel with many missing vines. Speaking of the low-lying goblet, he says that in the past this was also the way the vineyard was trained in Burgundy. He says that the low goblet is good in relation to the flow of sap : on high-trained vines you will tend to have less clusters but bigger ones while on low goblets you'll have more grapes but smaller fruits. Both viticultural techniques yield about the same volume of potential juice, but when you get this juice from small fruits you get juices that are naturally more concentrated. These missing vines are not a question of old age but that's because this parcel has not been properly drained when it was planted. Georges Descombes took over this parcel recently and there's little he can do about it, this part of the parcel is easly covered by puddles when it rains a lot and usually before planting you take care of these relatively flat grounds with clayish undersoil trapping the water by drawing drains which may be parallel to ther rows, or perpendicular or even diagonal, it depends of the terrain and optimal water flows. Putting drains in place has always been done for centuries and it must not be mistaken with terroir reconstruction. Georges Descombes tried to replant vines but not to avail, the edge of the parcel is too wet. He will ultimately put in place two drains (he shows us where) along the rows and 3 or 4 perpendicular to the rows, in a way to keep the water from drowning the vines, but he'll have to uproot first. 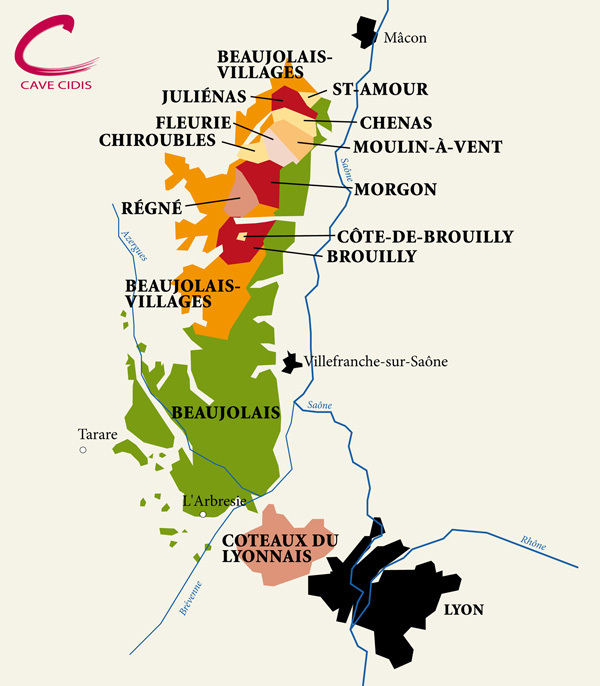 He says that there is no such water problem in his Brouilly parcels because of the dominant granite nature of the undersoil, the water being drained away easily through the rocks. While driving in the area we passed a heap of gravel intended to draw drains across a soon-to-be-planted parcel (not his) which was actually inundated after all these rainy days (see picture on right). That's what he'd do the day he decides to uproot this vineyard. The vines clearly don't like water, they fare much better missing water than having plenty of it. And the wine is better too when the vine struggles, it reminds me what Jean-Michel Deiss said and which is in my opinion a central truth of viticulture and winemaking : "to make a good wine, you need a vineyard that struggles for survival", Jean-Michel Deiss adding at one point "the vine must sort of feel something one morning, like, I'll not make it". Dead soils, Beaujolais version #1 Georges Descombes is part of the minority of Beaujolais growers not spraying chemicals and herbicides on their vineyard, but a drive through the wine routes of the Beaujolais at this time of the year is__ again__ an informative aside to help visualize how the undersoil is desertified by commercial wineries. You need to be around in april or may to see this striking difference between the vineyards because at this season, there's either already a visible life on the ground or the lack thereof while in summer the vines' own foliage obscure the appearance and condition of the ground, and the dead soils may go unoticed. Don't expect the wine mainstream magazines to cover these issues and even less print such pictures, go back to sleep, there's nothing to see. And though, everyone with a bit of wine experience knows that the quality of the wines is tightly connected to the vine condition and soil life. Dead soils, Beaujolais version #2 I am sorry to ad these sour notes but they're part of the picture, and when you drive through the region you see that everywhere you look, and at a point that you wonder why growers keep stubbornly turning their soils into dead zones when they see the great job made by fellow vignerons like Descombes, Brun, Foillard, Metras, Balagny and others whose wines stand out and sell like crazy. __ Georges Descombes, Beaujolais (cuvée classique) 2012, sample from large-volume wooden vat (like the one on the left). Tastes good already, lightly fizzy, didn't get any SO2. Cabonic maceration, a bot less colored than previous years, and he made no pigeage (cap punching). Will be bottled somewhere in july. Already in 2011 he used both cement and wooden vat (in the past it was 100% cement vat). This wine will be blended with the one in cement. There will be a small homeopatic SO2 adding at the blend, to prevent undesired oxygenation. He noticed that a very light SO2 adding yields a wine that recovers better from the bottling, compared to the one without. He says that the harvest in 2012 was 35% smaller in volume compared to 2011. __ Georges Descombes, Morgon 2012. More substance, a bit more colored. Georges Descombes says that 2012 is a nice vintage, even though lighter than 2011, the problem is the smaller volume and the higher cost of work in the vineyard to counter the disease push, in short, he adds, they got 35 % less volume for 35 % more expenses in the vineyard management, so they don't really make money this year. Also bottled around july. __ Georges Descombes, Brouilly vieilles vignes 2011. Old vines, around 50 years. Bottled september 2012. Nice wine. 8-month élevage in casks. __ Georges Descombes, Regnié vieilles vignes 2011. Nice too, no spitting. Meat juice, nice mouth feel and swallowing. __ Georges Descombes, Morgon 2011, also bottled in september 2012. __ Georges Descombes Chiroulbles vieilles vignes 2011. Very nice wine. Dust feel, life feel too. Light, fresh, suave, very enjoyable. Costs 15 € tax included. Small volume, they have only 1/2 hectare on this terroir. __ Georges Descombes, Morgon cuver Vermont 2011. A new (and only) cuvée from a selection of old vines that were vinified separately and had an élevage in newer casks (1- or 2 wines old). Because the potential was nice in 2012 as well as the volume, they decided to vinify it separately. These old vines have been uprooted since. 3000 bottles in total. He says that it's still young to be appreciated at its best. Pic on right : straddle tractor (enjambeur) with plowing clays to get rid of the weeds. Sealing a bottle with wax At one point we saw Georges Descombes giving a hand at the waxing of bottles, but to our surprise this wasn't gamay but a white wine (chardonnay), something quite This Beaujolais Villages Blanc (white) 2011 is made by himself under a separate labelling. he says that he set up a négoce company last year with his wife and younger son, in order to make wine from purchased grapes (it helped counterweight the volume loss, I guess). The commercial name of this separate business is G. Descombes. He buys grapes either from his son who got some his vineyards or from third parties, including in the future grapes from the region of Saint Amour, an area being too far (25 kilometers) to take care personally of the vineyards. 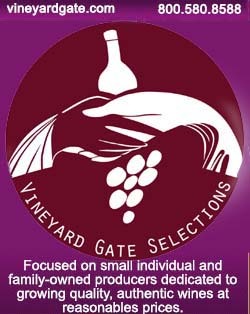 Now of course, he selects growers who work well in the vineyard, this may be growers who did the right thing on the vineyard side but haven't yety a customer base to sell the wines. We tasted a few of these wines. __ G. Descombes Fleurie 2010, vinified at the grower's chai and élevage over there too, but entirely by Georges Descombes. The originator vineyard is well worked and tended. More tannins but after warming the glass that's fine. waiting the right temperature __ G. Descombes Beaujolais Blanc 2011. From purchased grapes. One-year élevage in a vat, on in its lees. Small volume : 1000 bottles. Very enjoyable, there is this vividness that you find also with the wines of Valette or Villemade, not bad for a first try... The vineyard, which is farmed organic and in biodynamy, is located in the area of Le Perréon near Saint-Etienne-la-Varenne south of Villié Morgon (about 16 km). The bottle costs 7 € without tax. Georges Descombes told us about the questions he had with this yellow wax, he had never used yellow wax before for his seals and he wanted a yellow one for this white, so he contacted Jean-François Ganevat because he remembered that Ganevat used yellow wax and that it had the perfect middle-ground, it was soft enough and yet without the brittle side that sommeliers hate (all these tiny fragments of wax falling either in the bottle or in the glass. Ganevat gave him tips about the proportion of synthetic wax and normal wax to mix in order to get the right blend. The viscosity is important too when hot: after a skillful move of the bottle upside down in the hot wax, the wax must not flow down from the neck, it must stay put, rigidified almost instantly by the cold temperature of the air. Guy, helping with the operation A rosé by Descombes Here is another wine that Georges Descombes doesn't make on a regular basis but that he may now have every year : a rosé. __ Georges Descombes "la Rincette", rosé 2011 (estate wine, not the négoce), table wine (Vin de France). Rincette means rinsing your palate, another word for thirst wine. Gamay, made from bleed and direct-press juice, the two being blended. The wine is technically a Beaujolais but the sourced grapes come from different Beaujolais appellations and that would not fit in the appellation labelling. He may use bleed wine from Morgon, Brouilly etc... The color is strange, almost orange. This rosé is the result of very long fermentations under low temperatures. 3500 bottles in total, more or less, bottled in october 2012. There's a residual-sugar feel but it is completely dry (under 2 grams). Light filtration at the end as well of a small SO2 adding. Price 5 € professional price (without tax). In 2012 there wasn't enough volume because of the weather and he didn't make some. Good concentration feel in the mouth, higher alcohol level maybe too. Nice perspective beyond the muddy surrounding No, Georges Descombes isn't also raising a pig in a fenced corner of his backyard for charcuterie and other delicacies, but this pig was frolicking in the mud near the next house, and his neighbor seems to have kept the old-time practice of French farmers, raising the pig for hearty family consumption. Bertrand. Its with absolute pleasure that I follow you for the last 10 years. At least it feels like 10 years?! Your blog is simply fantastic! Thank you for sharing your knowledge with such humble gratitude. You are the true guide.